I am but a small child who has been here just a short time. I am watching, listening, and learning about my world. I learn from all of you. I am learning how to trust and respect others. But in order to learn to trust and respect, I need you to trust and respect ME. I may be little, but I am still a person. A whole, capable person. I have feelings and opinions and ideas. You may not agree or like or even understand them, but they are mine. Please respect them. Please respect that though you are trying to help me, it takes time for me to trust you. Can you please be patient with me? Please respect that it can be scary when big people talk down to me. Can you please kneel down to speak to me instead? Please respect that this is my body. Can you please ask if it is ok to touch me? Please respect that going with new people can be scary. Can you please ask me if I’d like to hold your hand, rather than pulling me? Please respect that I am learning how to talk about and handle my big feelings like fear, anger and frustration. I may yell, cry and throw myself on the ground because these feelings are too big for me to communicate. Can you please “listen” to my actions and help me through these feelings rather than dismiss them or punish me? Please respect that sometimes I am uncomfortable talking to new people. I am not being be rude, I am learning to trust. Can you please be patient with me as I get to know you better? Please respect that sometimes I may shut down when you ask me to do hard things. I am not doing this because I am “spoiled”. I am still learning to communicate these feelings and sometimes this is how I show you it’s too hard for me right now. Can you please trust me and give me a little more help? Please respect that I learn through play. My little body isn’t designed to sit for long periods of time. Can you please allow me to wiggle and move when I need it? I may be small, but please….I deserve respect too. How can I learn to trust and respect the people in my life, if I am not given respect? I love this Katie! Such great reminders. I often get in such a rush at work that I have to remind myself to slow down and really take a hard look at the little people I see for treatment sessions. To stop and think less about what I “need” as a therapist (data, paperwork, etc.) and more about what the child really needs in that moment. Thanks for the great post! It is a hard balance sometimes, isn’t it Claire? I feel that I have gotten better at this since becoming a parent myself yet I still need reminders! Our little ones need us to respect them so they too can learn to trust and respect. Thanks for stopping by! SLOW. CLAP. What a wonderful post! I’ll be sharing! Children learn from the adults around them. All too often they are expected to give adults respect, but the same is not given to them. Exactly! 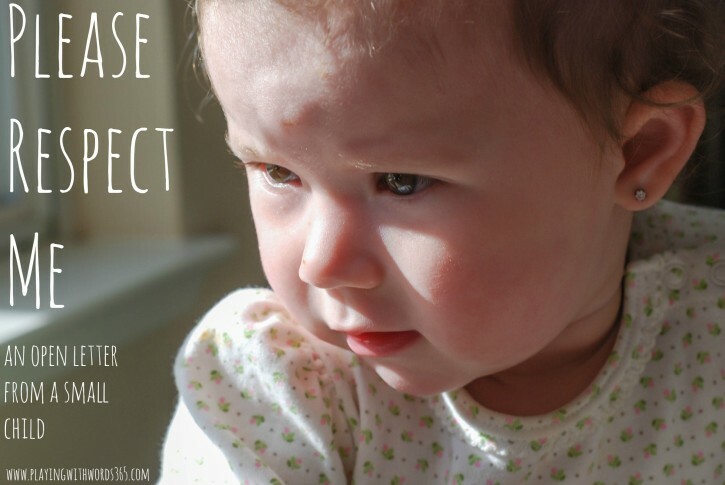 How can our little ones *learn* respect if they are not GIVEN respect? We need to live by example. Thanks so much for stopping by! I am a Dutch speech pathologist, also mum of two daughters; 3 and 5 years old. What a wonderful website, full of inspiring information. And what a strong and heart-opening letter from this small child. A great reminder for me, but also for a lot of other adults and parents. I’ll take this with me when I coach parents during an ” It takes two to talk” (Hanen-program) sessions! Wonderful post and a great reminder for us all to remember. Thanks you Jodie! I agree…I forget this myself more than I care to admit! I love this Katie! ALL big people need this reminder sometimes! Very profound, and so appropriate, thank you for this. Hi Anna! Thanks for stopping by. So glad you enjoyed this and thanks for sharing! Thank you so much for posting this. I’m definitely sharing this! I do love this letter and fully agree with it. What I find strange though is the photo of the child that has been used for the article. Is it not disrespectful to a child of this age to decide for them to have their ears pierced?